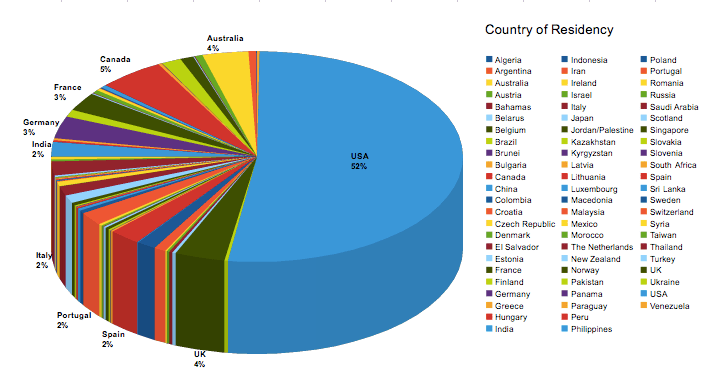 In February of 2012 OSHWA conducted a survey of the international open source hardware community, which received 2091 responses from 70 countries. These are the aggregate results. 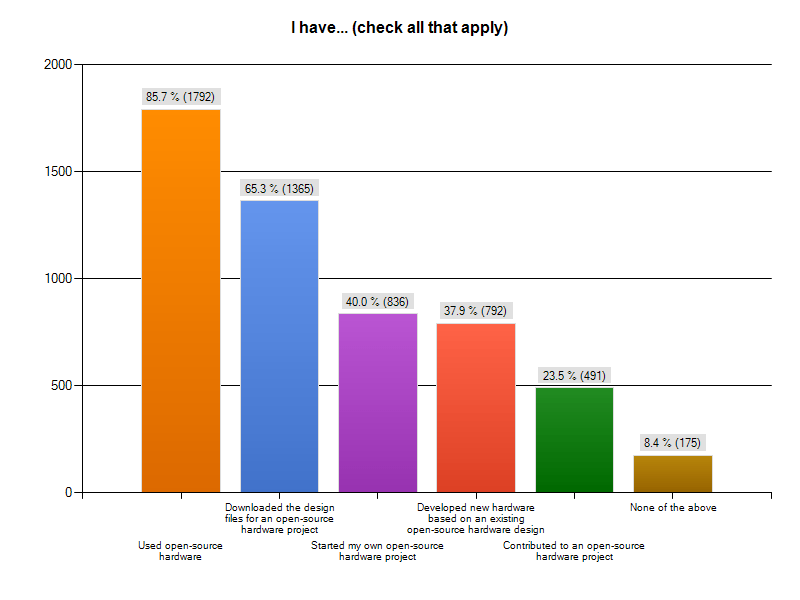 Bryan Bishop has kindly provided a master file with all the survey results. You can download it here. Q1. Do you consider yourself a…. Q2. 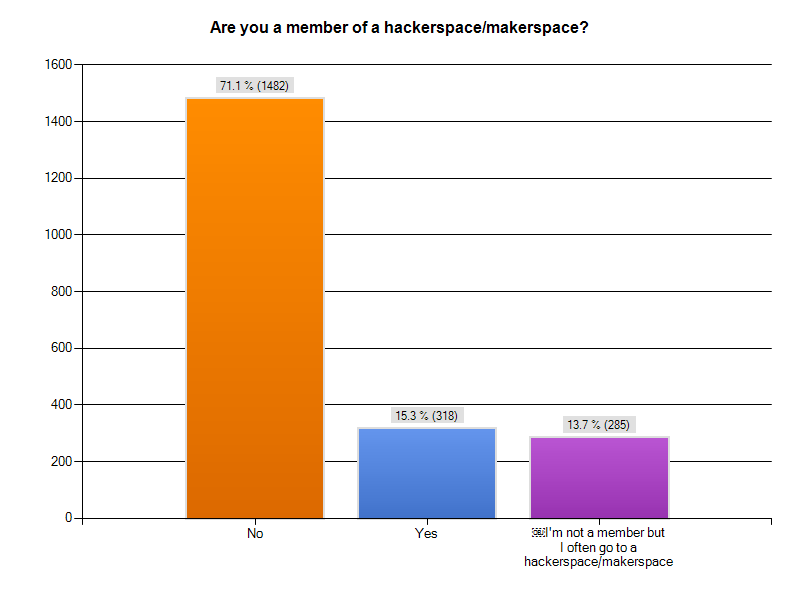 Are you a member of a hackerspace/makerspace? Q3. 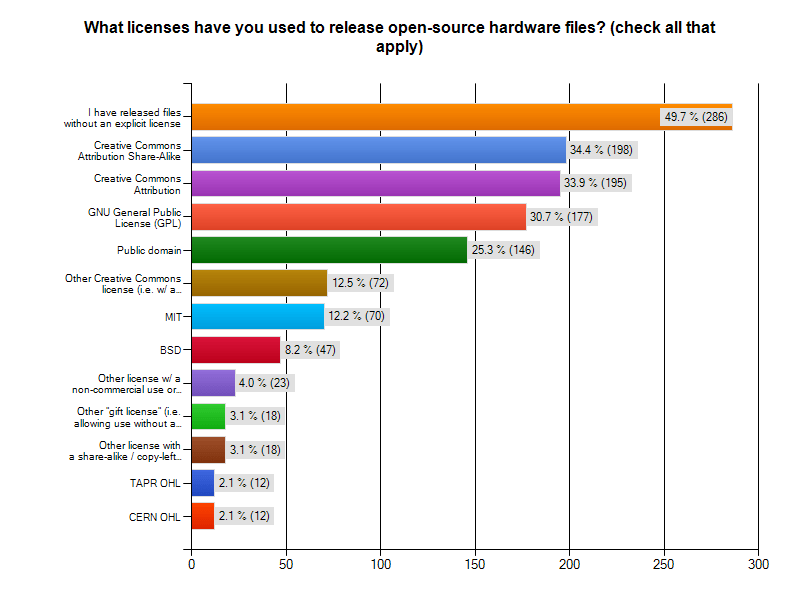 How did you first find out about open-source hardware? Q5. 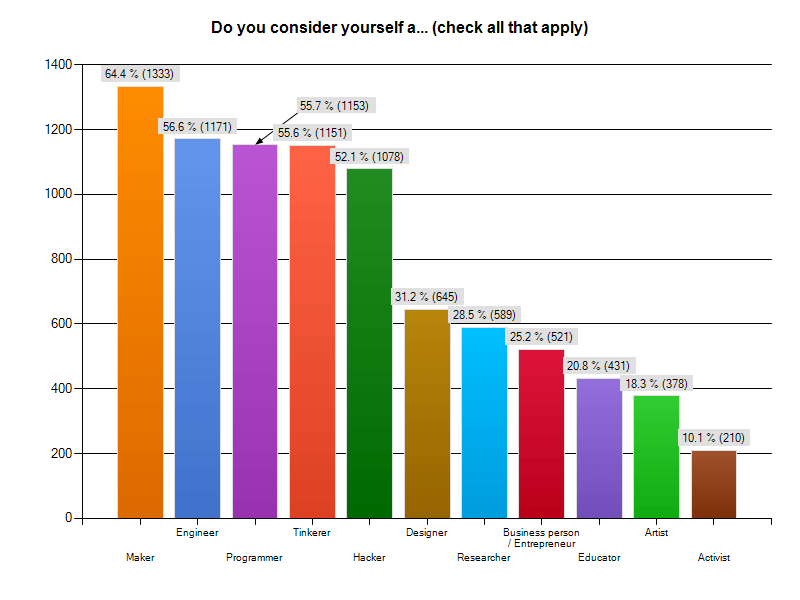 What do you use open-source hardware for? Q6. 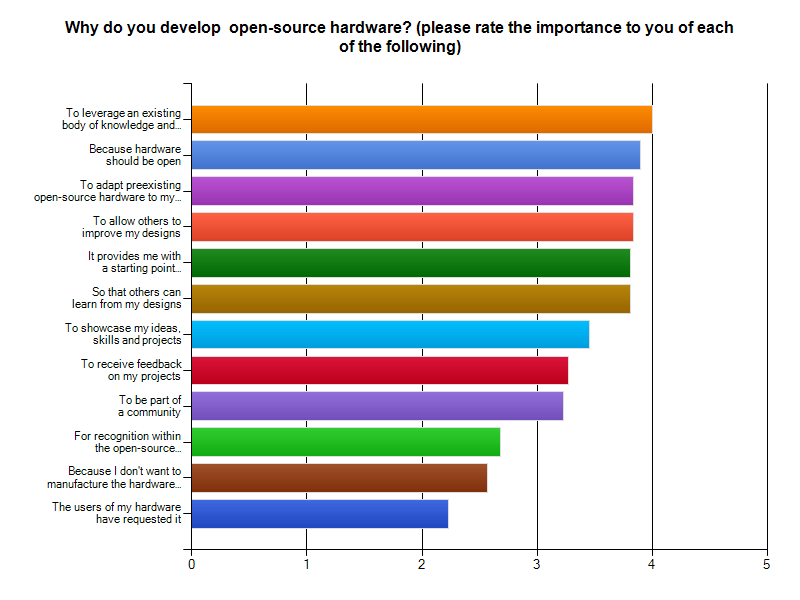 Why do you use open-source hardware? Q7. Tell us more about your use of open-source hardware: which hardware you use, what you use it for, and how you take advantage of the fact that it’s open-source. Q8. 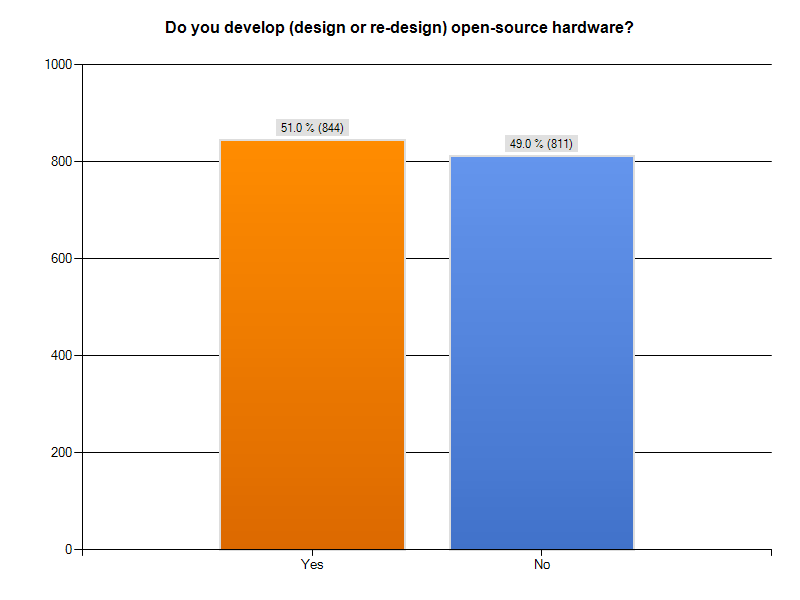 Do you develop (design or redesign) open-source hardware? Q9. 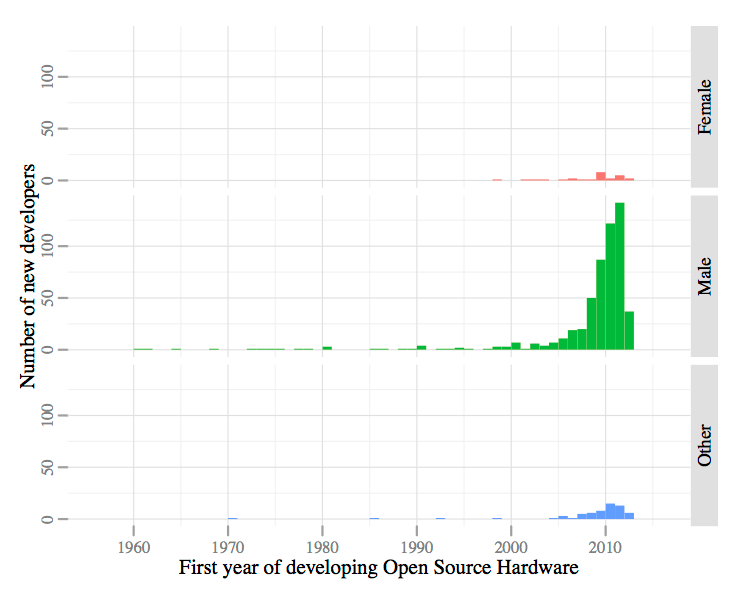 What year did you first begin developing open-source hardware? Q10. 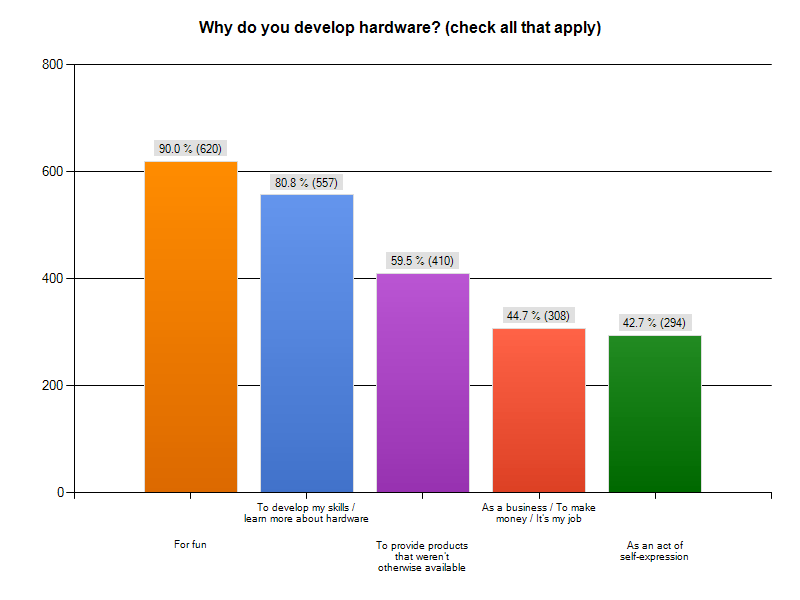 Why do you develop hardware? Q11. 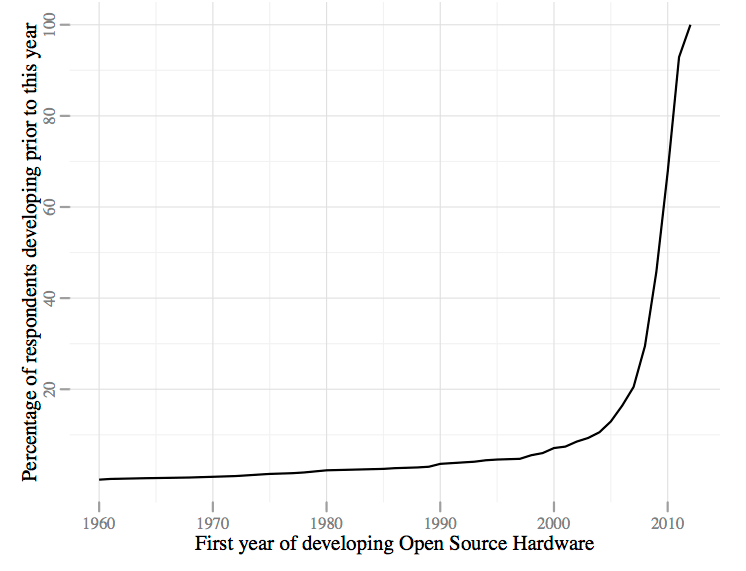 Why do you develop open-source hardware? Q12. Which of the following have you done? Q13. 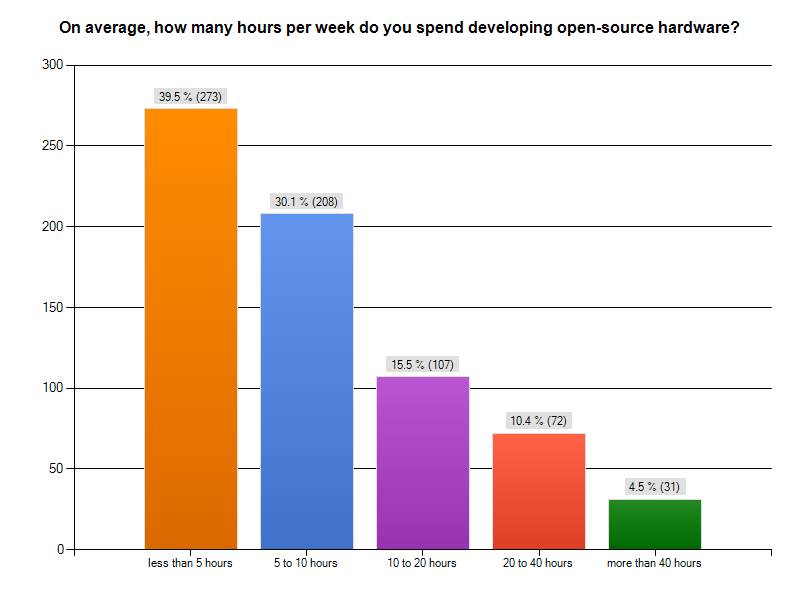 On average, how many hours per week do you spend developing open-source hardware? Q14. Tell us more about your relationship with other open-source hardware projects. Do you draw on their designs? Do they draw on yours? Do you suggest improvements and changes to each other? How would you explain the nature of the relationship between your work and that of others? Q15. Tell us more about your process for developing open-source hardware: who you work with, how you collaborate, your role, what tools you use, etc. Q18. Do you use the Open Source Hardware logo on your hardware? Q19. 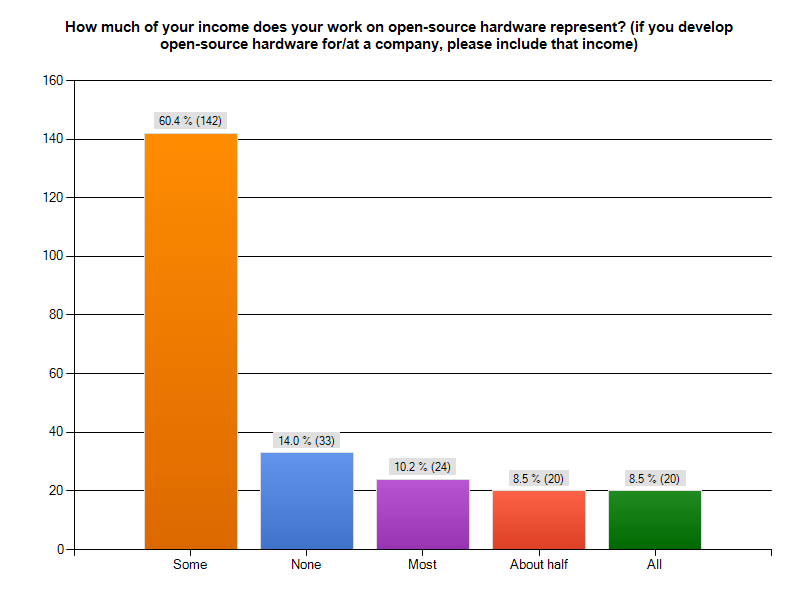 Does any of your income come from working on open-source hardware? Or do you develop open-source hardware for/at a company (as a founder, partner, owner, employee, contractor, freelancer, etc.)? Or do you make and distribute open-source hardware? Q25. 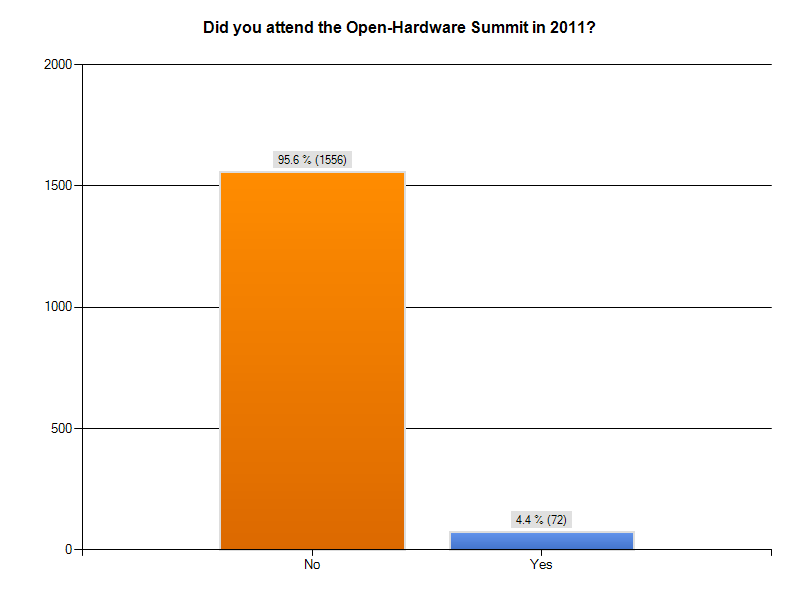 Did you attend the Open-Hardware Summit in 2011? Q26. 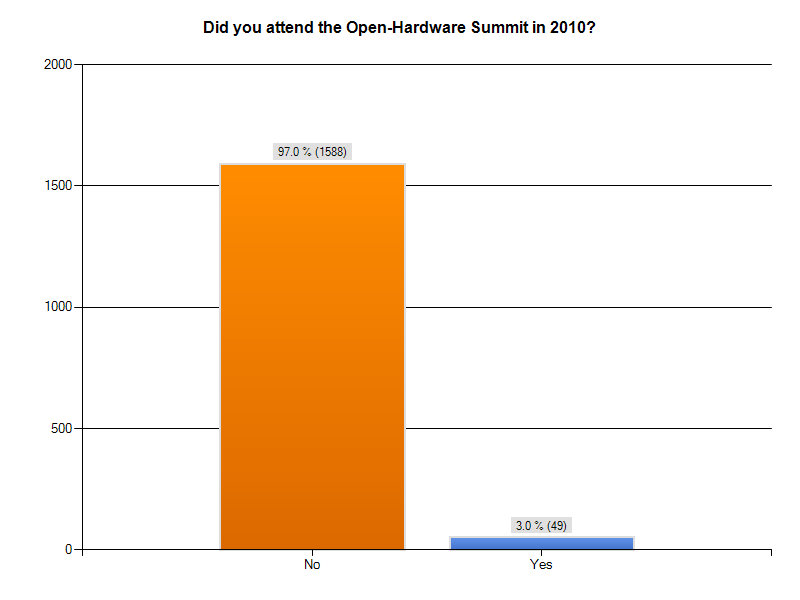 Did you attend the Open-Hardware Summit in 2010? Q27. Do you have any comments, thoughts or stories about open source hardware you’d like to share? Q28. How old are you? Q29. Where do you live? Q31. 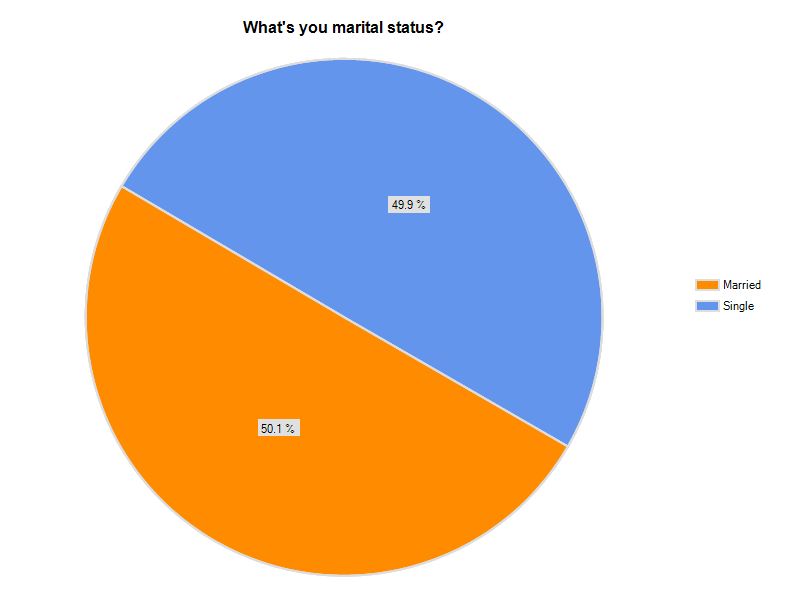 What’s your marital status? Q32. Do you have children? Q33. 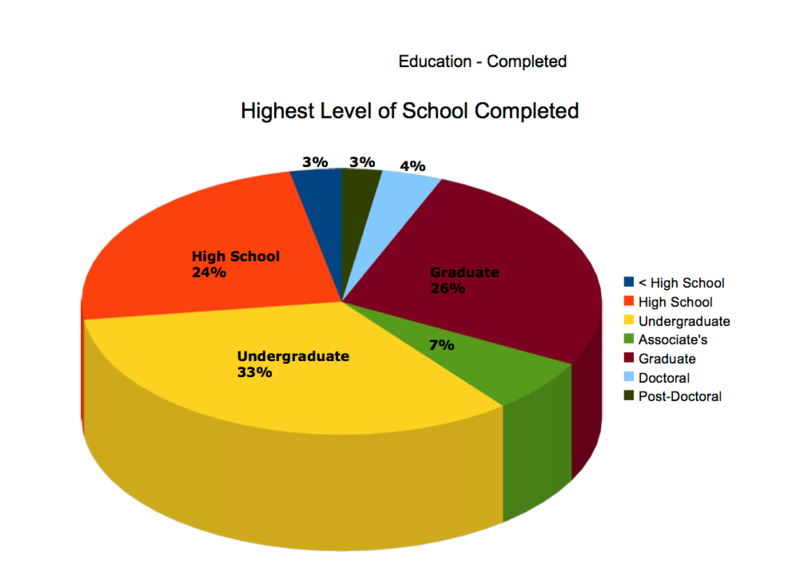 What’s the highest level of school completed or the highest degree you have received? Q36. Do you have any feedback or comments about the survey? A huge thank you to everyone who took the time to answer these questions! Great information. 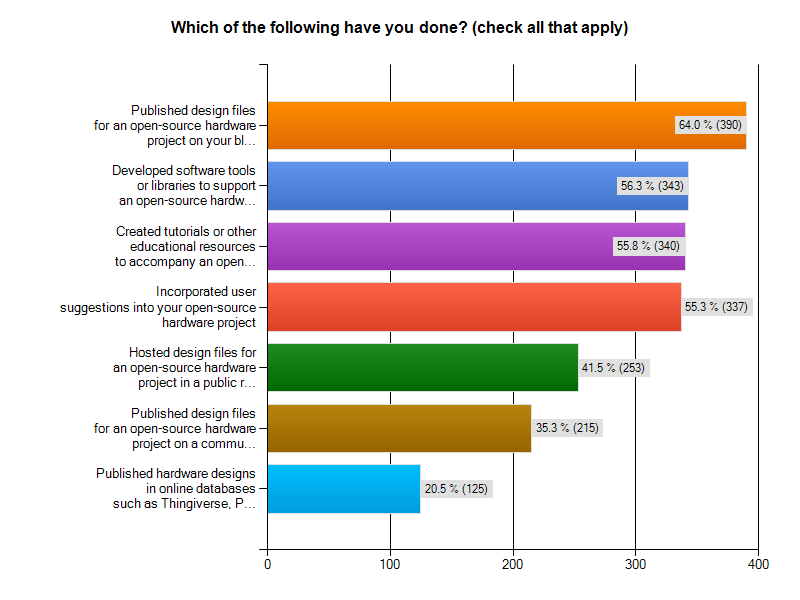 Something it would be nice to see in the next survey is a question regarding where people get their open source hardware news/info. 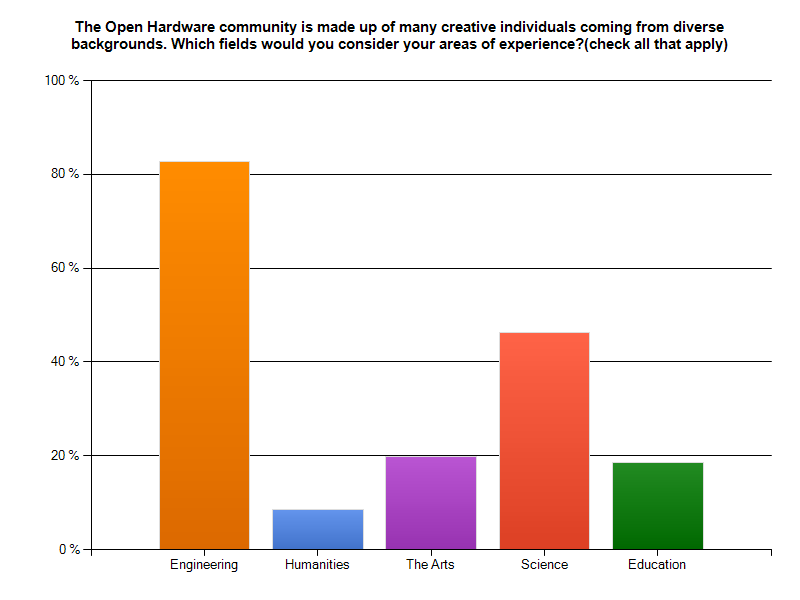 Pingback: Arduino Blog » Blog Archive » Take the 2013 Open Source Hardware Community Survey.